This week I signed my ten year old daughter up to Sharesies using their kids platform and I documented it as I went through the process. I already have a $50 monthly investment ticking over for her where she is buying directly (not using Sharesies) into a SmartShares NZ Top 50 Fund and this has been returning her 11% after fees and taxes. I started this for her in Jan so this return is not too shabby. Not too shabby at all. In fact their one year returns are 17% (distributions reinvested and after fees and tax). I don’t subscribe to the view of “leaving my daughter to it”; that when she is old enough she can earn her own money and save for herself and she will miraculously become wealthy. Just take a listen to my podcast and you will come to notice that those who were not taught about and helped with money growing up tend to be those who are currently saddled with massive mortgages because they subscribe to the view that taking on debt is the only way to get ahead. In my view starting young, learning how money works and investing over a long period of time is the way to get ahead. I could easily have set up another SmartShares fund direct with them but I didn’t have another $50 a month to spare for her investments (I’m generous but not that generous), which is the minimum monthly investment they require. Sharesies as you probably well know by now will accept just a $5 investment which is more doable for her/me. 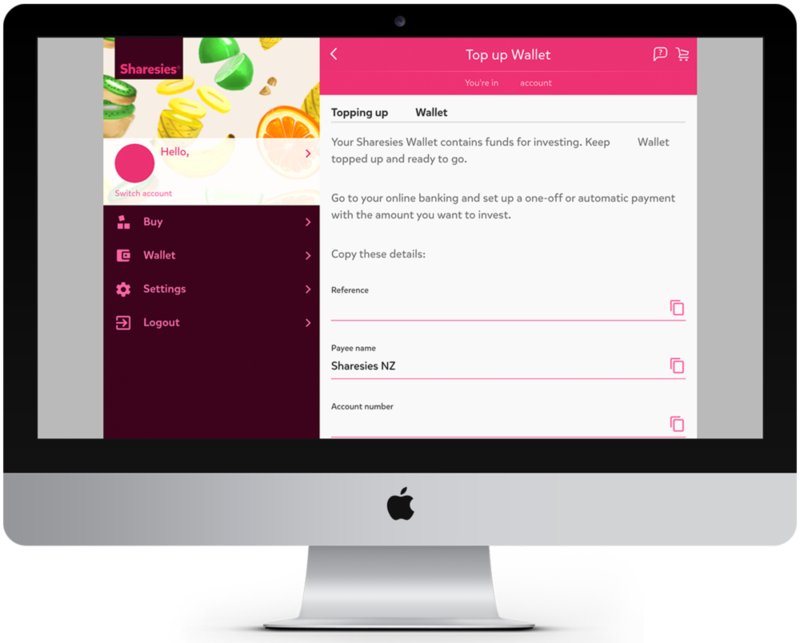 Whereas she is aware of her current SmartShares investment she is not involved with it because it is automatic but Sharesies is going to give her the chance to actually push the “BUY” button and take part in the process which I think is great. To set up a child under 18 I have to be signed up with them, which I already am. A kids account is a separate account in my name (as trustee) for saving and investing money on behalf of a child. My daughter is the “beneficiary” of the account and I will administer it for her benefit and all money received is a non-reversible gift to her. FYI you don’t have to be the parent of the child to create a fund for them. She is only 10 years old at the moment and the transfer date for her to be entitled to the money and investments in the account is set at 25, but I can change this to as low as 18 if I want to. Sharesies kids account legal stuff. I’m leaving it at 25. For now. At the point she reaches that transfer age I will bow out of it and she can request to take control of the account without my permission. They will convert the bare trust account to an account in her own name and it’s all hers to manage how she will. It’s at THIS point where you start to understand the value of teaching kids about money early in life. If she is rubbish with money because I never taught her any better then basically I’m not to be surprised if she gains access to this and blows it on a trip to Vietnam with her boyfriend/girlfriend! I have been asked the question a number of times “do I tell her about the money I have invested for her?” That’s a big “HECK YES” from me! I want her to be aware just how long it takes to acquire money; how many times she cat sat for payment and how many times she pulled the wheelie bin up the drive, so she begins to associate TIME with MONEY. If I were to tell her at the age of 18 or 25 “here is $50,000” she would be more likely to waste it in my view if she didn’t comprehend that I had been investing for her since she was born. With the Sharesies kids account fees are HALF the adult price and its automatically set up to pay her subscription monthly from her Sharesies wallet on the renewal date - the date she signed up. Sharesies kids account subscription amounts. I’m pleased fees are half price because when account balances are really low fees take a big chunk of your investment in the early days (which is what I’m finding with my own account). I agree to take care of tax returns and payments to her account and what have you and that if anything changes in her situation it will be ME that lets them know. I used her passport so they could legally identify her and I didn’t have to scan it in which was great and after about 10 seconds the computer verified her. I loved the speed of the application process. 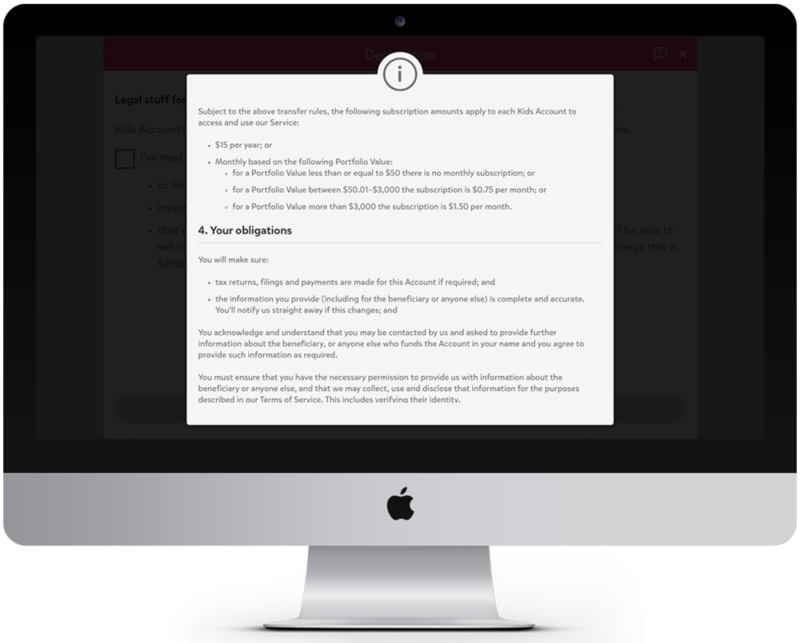 Next I entered her New Zealand IRD number - so you must make sure you have this prior to beginning - and I answered a couple of other quick questions too. Woo - finished signing up. BOOM, we were in, seriously this took five minutes max. If that. They appreciate the fact that we might not have invested for kids before so they offer investments to consider, particularly those that are the most tax efficient for kids. They also remind you to go into the settings tab to make sure you select the appropriate prescribed investor rate (PIR); for most kids it’s the lowest rate at 10.5%. I then went and set up an automatic payment to top up her wallet each week with $5.50. Our rule is that each time she earns ANY money she must pay half into her savings account so for many weeks this will be entirely her money she is investing, other weeks I’ll contribute and that way we make sure she is investing consistently. Email from Sharesies letting me know money has arrived in her wallet. We are locked and loaded! Let’s invest! I ummed and arred about which of their 13 index funds to choose from. They have ones marked “Kids” because the tax rates are more favourable (10.5% in my daughters case) but in the end I decided to just stick with the US500 Fund where she will be investing in a SmartShares fund and be taxed at 28%. This tax rate should bother me but it does not. She is starting with the $14 that her Auntie Liz gave her and her first direct debit of $5.50, so $19.50 in total will be her first investment. Let’s face it, the tax payment on the money that $19.50 makes is going to be minute. I like the US500 Fund because it gives her access to a massive range of international companies and it’s one year returns have been 28% (distributions reinvested and after fees and tax), so despite trump still being the biggest moron ever, their economy is still going OK. So I figure we can just reassess any tax implications as the pot grows. The longest wait in this process was for the school day to end so she could purchase her very first shares all by herself. Was she excited? Meh! When she pressed “BUY” and a medal flashed up on the screen telling her she had made her first purchase she did say that it made her feel “special”, so that is something I guess! She was more concerned about if this was “really the money from Auntie Liz” and how it came to end up on the computer, so that began a whole other conversation around physical cash and internet banking. Love it! Will she be excited when she decides to leave home one day and has a financial buffer to pursue whatever path she wants to take? I suspect she will be, I just need to give it time!